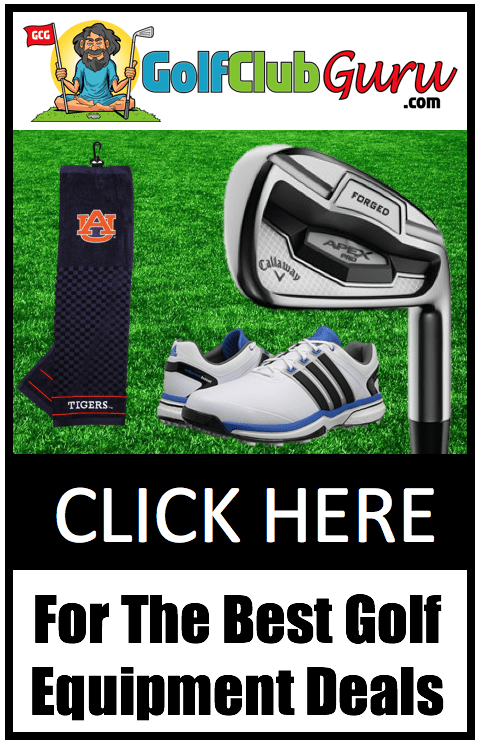 You might feel useless off the tee with a driver in hand. Hitting slice after slice can be frustrating and embarrassing. (Quick tip: strengthen your grip, take the club more outside on the backswing, and swing more to right field on the downswing). You adjust the club to be closed at address. This way, with everything else staying constant, you can attack the ball with a square club face. This is a quick fix and I wouldn’t suggest it. 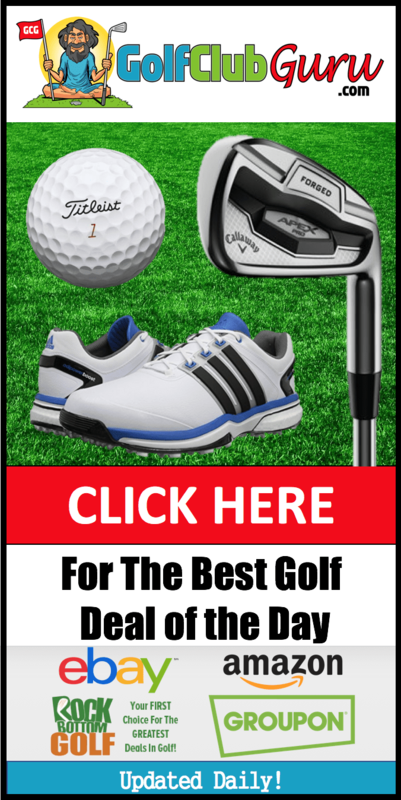 You use a driver that has more weight on the heel than the toe. Why is that? Well, if there is too much weight on the toe end of the driver, that means it requires more force (hand and wrist action) to close the clubface and hit the ball square. This is a better option. The two reasons above are a large part of why club manufactures started making adjustable clubs, so they can change the face angle and the weighting. So now we know that, for a club to be optimized to cure slices, we need adjustability and heel weighting. Below I have picked out 5 drivers that will surely help cure the slice and encourage you to hit high, soft draws like you have always wanted! Note: if you were to click on any links/pictures below, you will end up on eBay listings for the respective drivers. If you never want to hit a slice again, my best suggestion would be to buy a TaylorMade M1 driver. The T-Track Adjustability System (one moving vertical weight and 1 moving horizontal weight) allows you to move the 15 grams of weight closer to the heel to encourage the club face to turn over and be square at impact. Next, the M1 provides 12 different loft sleeve adjustments for loft (plus or minus 2 degrees), lie, or face angle. Face angle and lie go hand in hand by the way. A more upright lie with result in a closed face angle. So, make sure you make the adjustments necessary (see the adjustment book when you purchase the club) to get an upright lie and closed face angle. The combination of the 15g weight near the heel and the closed clubface should get you well on your way to curing that dreaded slice! 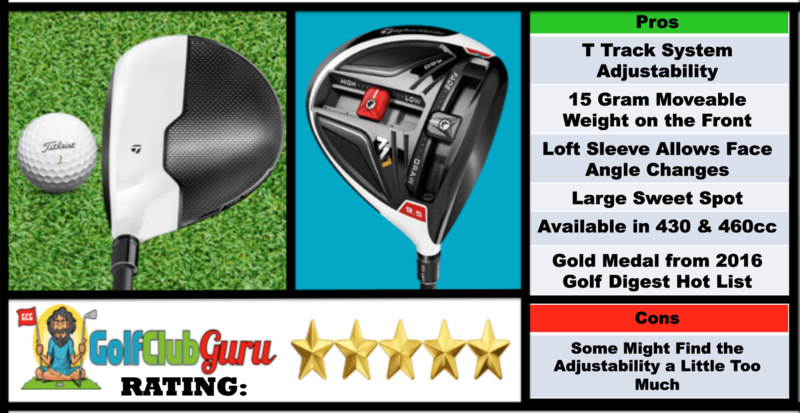 If you are looking for the best value club (AKA the best bang for your buck), then the TaylorMade R15 driver is going to be hard to beat. It features 2 12.5 Moveable weights that you can move towards the heel, just like the M1 above. You can also open or close the clubface by 2 degrees. 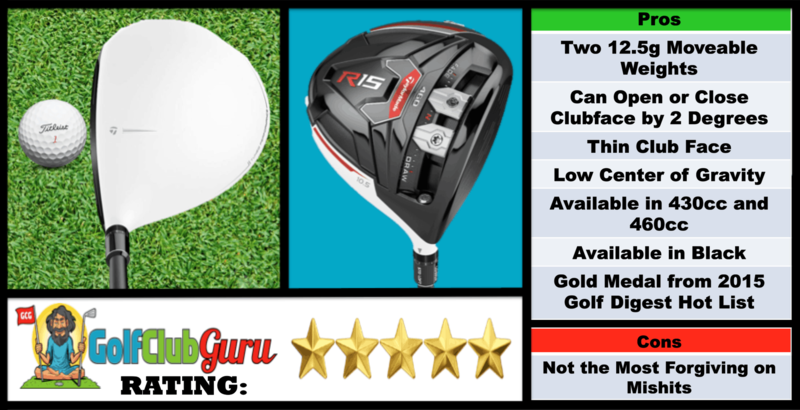 Besides adjustability, the R15 is an extremely long driver. The thin club face leads to a bigger recoil at impact and therefore more distance. It also has a very low center of gravity, leading to higher ball flights and more carry distance on average. The thing that makes the M1 better, however, is that this driver is slightly less forgiving. Mishits seemed to be a little spinny and didn’t go as far as I would have imagined. Other than that, they are nearly identical drivers, as the movable weight for higher and lower ball flights on the M1 doesn’t have a huge effect in reality. If you are not wanting to shell out much money to improve your slice, the TaylorMade SLDR is the driver to pull the trigger on. It has been featured many times on this website, as it truly is an incredible club that sells for low prices. As someone who slices, you probably haven’t been playing the game for too long (or maybe you have just been dreading the much needed swing change!). If that is the case, I would never suggest spending even close to $500 for a brand new, top of the line driver. With that being said, you can buy the SLDR driver, which made a HUGE impact on the golf industry upon its release, for under $100. 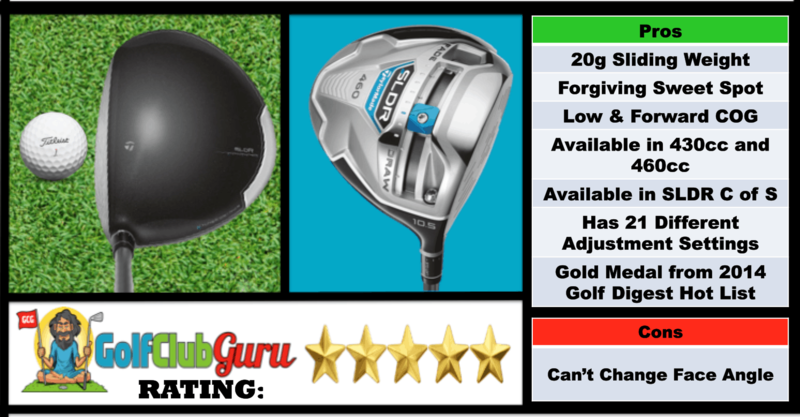 So what makes the SLDR a great driver for slicers? It has got a 20 gram movable weight that you can push to the heel to facilitate a square face at impact. It has 21 different hosel adjustments so that you can find the perfect one that leads a more closed clubface. The sweet spot is very large. Mishits still fly pretty straight. Lofts on the SLDR are much higher than usual (While you might normally play a 10 degree driver, it wouldn’t be unusual to play a 12 degree SLDR driver.) This is because they moved the COG low and forward. Higher lofted clubs are easier to hit draws with, so this is a benefit for you! 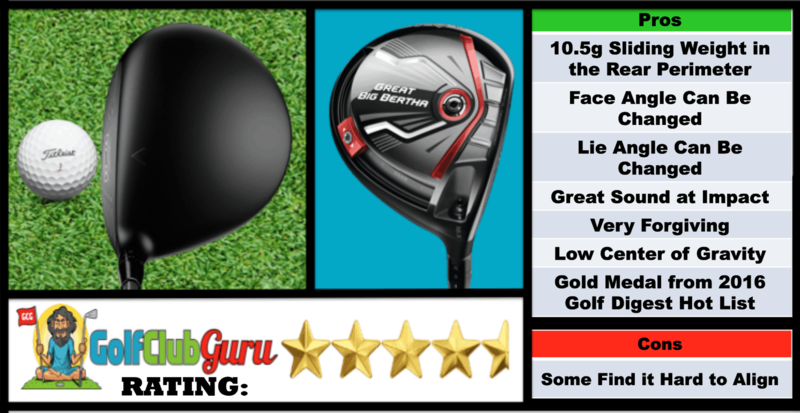 The Callaway Great Big Bertha driver has a very desirable mix: it has a great design paired with easy adjustability. The 10.5 sliding weight in the sole of the driver can be placed very close to the hosel, making the toe of the club feel lighter and therefore easier to turn over during the swing. The loft sleeve also allows you to change loft, lie, and face angle to further get rid of your slicing habit. Besides the benefits from a strictly ball flight standpoint, this driver has a very low COG and a great sound at impact, like nearly every recent Callaway driver. 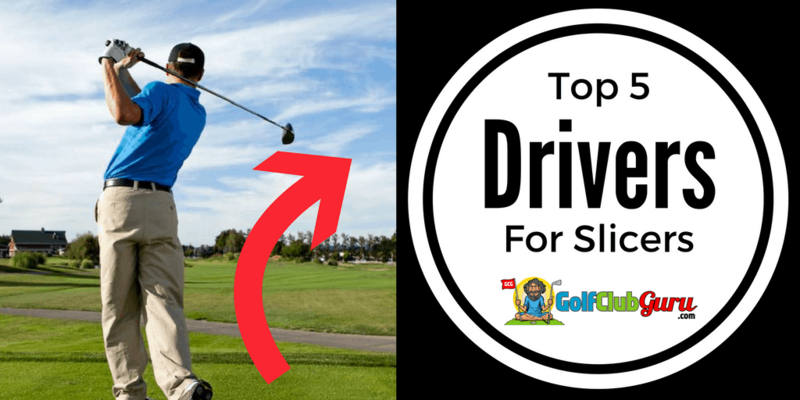 These characteristics make this a great driver for a beginner. It didn’t earn a gold medal from Golf Digest for nothing! 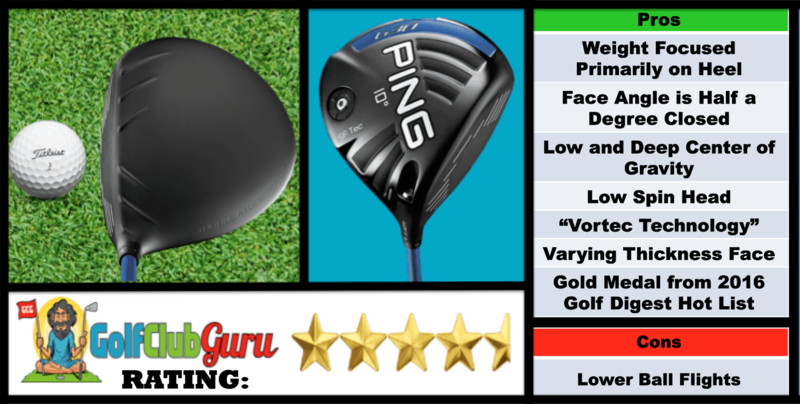 If you play in a lot of windy conditions, or if you simply want to bring down your ballflight to a more penetrating one, I would recommend the Ping G30 SF Tec (stands for Straight Flight). For a slicer, this club offers many obvious benefits. To begin with, the face angle is half a degree closed. That’s half a degree that you no longer have to worry about in the golf swing. Secondly, the weight is primarily placed in the heel of the club, as you can see in the picture above. That combination alone should be enough to make an impact on your drives. As added benefits, the Ping G30 SF Tec has a low spin head, which leads to balls that don’t carry as far, but they roll forever. Innovation-wise, the Vortec Technology and the Varying Thickness Face are two technologies that improve the consistency and distance of your drives. If you reached this far, I want to thank you for reading. If you have any questions, please comment below! Rattling wonderful info can be found on web blog. Some truly quality content on this internet site, saved to favorites. I in addition to my buddies have already been following the nice items from your site and then suddenly developed a horrible feeling I never thanked the website owner for those secrets. Those people came for that reason warmed to read them and now have honestly been enjoying these things. We appreciate you genuinely quite considerate and then for having certain outstanding subject areas millions of individuals are really wanting to know about. My sincere regret for not saying thanks to you earlier. I am always looking online for tips that can help me. Thx! Woh I enjoy your blog posts, bookmarked! . I do not even know how I stopped up right here, but I believed this put up was once good. I do not realize who you’re however definitely you are going to a well-known blogger for those who are not already 😉 Cheers! You made various fine points there. I did a search on the matter and found a good number of persons will agree with your blog. I will immediately clutch your rss feed as I can not in finding your e-mail subscription link or newsletter service. Do you’ve any? Kindly allow me recognise so that I could subscribe. Thanks. Most of the things you articulate happens to be supprisingly appropriate and that makes me wonder why I had not looked at this in this light previously. This particular article really did switch the light on for me as far as this issue goes. Nevertheless there is actually one point I am not necessarily too cozy with so while I make an effort to reconcile that with the core theme of the position, allow me observe what all the rest of your subscribers have to point out.Very well done. Hey There. I found your weblog the usage of msn. That is a really neatly written article. I’ll make sure to bookmark it and come back to learn more of your useful info. Thank you for the post. I’ll definitely return. Hello! I could have sworn I’ve been to this blog before but after checking through some of the post I realized it’s new to me. Anyways, I’m definitely glad I found it and I’ll be book-marking and checking back often! When I initially commented I clicked the -Notify me when new comments are added- checkbox and now each time a remark is added I get 4 emails with the identical comment. Is there any means you may remove me from that service? Thanks! Hi there! I could have sworn I’ve been to this blog before but after checking through some of the post I realized it’s new to me. Nonetheless, I’m definitely happy I found it and I’ll be book-marking and checking back often! Magnificent website. Lots of useful info here. I am sending it to a few friends ans also sharing in delicious. And obviously, thanks for your effort! There is visibly a lot to realize about this. I assume you made certain nice points in features also. I was looking at some of your blog posts on this website and I think this web site is really informative! Retain putting up. I enjoy you because of all of your work on this web page. My mom really loves engaging in investigation and it’s really simple to grasp why. Most people hear all regarding the compelling form you create rewarding things through this website and as well welcome participation from others on this concern plus our favorite daughter is actually becoming educated a lot of things. Enjoy the rest of the year. You’re doing a dazzling job. I am not sure where you’re getting your info, but good topic. I needs to spend some time learning more or understanding more. Thanks for fantastic information I was looking for this info for my mission. It’s a pity you don’t have a donate button! I’d most certainly donate to this superb blog! I suppose for now i’ll settle for bookmarking and adding your RSS feed to my Google account. I look forward to brand new updates and will share this blog with my Facebook group. Chat soon! I see something genuinely special in this website . Some genuinely interesting information, well written and broadly speaking user friendly. Hey! I could have sworn I’ve been to this website before but after reading through some of the post I realized it’s new to me. Anyhow, I’m definitely glad I found it and I’ll be bookmarking and checking back often! It’s truly a great and helpful piece of information. I’m happy that you shared this helpful information with us. Please keep us informed like this. Thanks for sharing. I’ve been browsing on-line more than three hours today, but I never found any interesting article like yours. It’s lovely price sufficient for me. Personally, if all webmasters and bloggers made good content as you probably did, the internet can be much more helpful than ever before. Great post, you have pointed out some fantastic points, I also think this s a very superb website. Perfectly indited subject matter, thank you for entropy. “In the fight between you and the world, back the world.” by Frank Zappa. Have you ever thought about publishing an ebook or guest authoring on other sites? I have a blog based upon on the same information you discuss and would really like to have you share some stories/information. I know my subscribers would enjoy your work. If you’re even remotely interested, feel free to send me an e mail. Hello there, just became alert to your blog through Google, and found that it is truly informative. I am gonna watch out for brussels. I will appreciate if you continue this in future. Lots of people will be benefited from your writing. Cheers! I think this web site contains some real great information for everyone : D.
I’ve recently started a blog, the information you provide on this website has helped me tremendously. Thank you for all of your time & work. I have been reading out many of your articles and i must say clever stuff. I will make sure to bookmark your blog. Good ?V I should certainly pronounce, impressed with your website. I had no trouble navigating through all the tabs as well as related info ended up being truly simple to do to access. I recently found what I hoped for before you know it in the least. Quite unusual. Is likely to appreciate it for those who add forums or anything, site theme . a tones way for your customer to communicate. Nice task.. Thank you for any other magnificent article. The place else may anybody get that kind of info in such an ideal manner of writing? I’ve a presentation subsequent week, and I am on the search for such info. I do believe all the ideas you have offered to your post. They are really convincing and will definitely work. Still, the posts are too short for beginners. May just you please lengthen them a little from subsequent time? Thanks for the post. Rattling clear web site, appreciate it for this post. I would like to thnkx for the efforts you have put in writing this website. I am hoping the same high-grade web site post from you in the upcoming as well. In fact your creative writing abilities has encouraged me to get my own blog now. Actually the blogging is spreading its wings rapidly. Your write up is a great example of it. What i do not realize is actually how you’re now not actually a lot more well-preferred than you may be right now. You’re very intelligent. You understand therefore considerably in the case of this topic, made me in my opinion imagine it from numerous numerous angles. Its like men and women aren’t interested except it’s one thing to do with Lady gaga! Your personal stuffs great. At all times take care of it up! Greetings! I’ve been following your blog for a long time now and finally got the courage to go ahead and give you a shout out from Houston Texas! Just wanted to tell you keep up the excellent work! I enjoy you because of your entire hard work on this web site. Debby takes pleasure in carrying out investigation and it is easy to see why. A number of us hear all of the lively medium you deliver advantageous ideas through this blog and as well improve participation from other individuals on this situation and my simple princess is in fact starting to learn a whole lot. Have fun with the rest of the new year. You’re carrying out a splendid job. Good – I should certainly pronounce, impressed with your web site. I had no trouble navigating through all the tabs and related info ended up being truly simple to do to access. I recently found what I hoped for before you know it in the least. Quite unusual. Is likely to appreciate it for those who add forums or something, web site theme . a tones way for your customer to communicate. Excellent task. It is really a great and helpful piece of information. I am satisfied that you simply shared this helpful info with us. Please keep us informed like this. Thank you for sharing. I really wanted to make a brief comment in order to appreciate you for all the unique concepts you are placing at this website. My time intensive internet look up has at the end of the day been compensated with reputable content to share with my friends and family. I ‘d declare that many of us readers are extremely fortunate to live in a really good site with so many special professionals with very beneficial advice. I feel pretty lucky to have used the website and look forward to many more exciting times reading here. Thank you once more for a lot of things. Does your website have a contact page? I’m having problems locating it but, I’d like to send you an e-mail. I’ve got some recommendations for your blog you might be interested in hearing. Either way, great blog and I look forward to seeing it grow over time. Do you mind if I quote a few of your posts as long as I provide credit and sources back to your blog? My blog site is in the exact same niche as yours and my visitors would definitely benefit from some of the information you present here. Please let me know if this ok with you. Thanks! Hey there, You have done an incredible job. I will definitely digg it and in my view suggest to my friends. I am confident they will be benefited from this website. whoah this blog is wonderful i love reading your articles. Keep up the great work! You know, lots of people are looking around for this information, you could aid them greatly. I have read some good stuff here. Certainly worth bookmarking for revisiting. I surprise how much effort you put to make such a wonderful informative website. It?¦s in reality a great and useful piece of info. I?¦m glad that you shared this helpful information with us. Please stay us up to date like this. Thanks for sharing. Thank you for sharing superb informations. Your site is so cool. I’m impressed by the details that you have on this website. It reveals how nicely you understand this subject. Bookmarked this web page, will come back for more articles. You, my pal, ROCK! I found just the info I already searched all over the place and simply could not come across. What a great web site. Hmm it looks like your site ate my first comment (it was extremely long) so I guess I’ll just sum it up what I submitted and say, I’m thoroughly enjoying your blog. I too am an aspiring blog writer but I’m still new to everything. Do you have any points for inexperienced blog writers? I’d genuinely appreciate it. Wonderful site you have here but I was wondering if you knew of any user discussion forums that cover the same topics talked about here? I’d really love to be a part of group where I can get responses from other experienced people that share the same interest. If you have any suggestions, please let me know. Thanks! Some really prize posts on this web site, bookmarked. Great write-up, I am normal visitor of one¦s web site, maintain up the nice operate, and It’s going to be a regular visitor for a lengthy time. Thank you for every other wonderful post. Where else could anyone get that kind of info in such an ideal means of writing? I have a presentation next week, and I’m at the look for such info. Excellent web site. Lots of useful information here. I’m sending it to some friends ans additionally sharing in delicious. And of course, thanks on your sweat! I just could not go away your site before suggesting that I actually loved the usual info an individual provide for your guests? Is going to be back often to inspect new posts. Yesterday, while I was at work, my cousin stole my apple ipad and tested to see if it can survive a thirty foot drop, just so she can be a youtube sensation. My apple ipad is now broken and she has 83 views. I know this is totally off topic but I had to share it with someone! I besides think thence, perfectly pent post! . I got what you mean ,bookmarked, very decent site. Thanks for some other magnificent post. Where else may just anybody get that kind of info in such an ideal way of writing? I’ve a presentation next week, and I’m on the look for such info. Thank you for another excellent article. Where else could anybody get that type of information in such an ideal way of writing? I have a presentation next week, and I’m on the look for such info. I loved as much as you will receive performed right here. The cartoon is tasteful, your authored material stylish. however, you command get bought an impatience over that you want be delivering the following. unwell certainly come more formerly again as exactly the similar nearly very steadily inside case you defend this hike. Regards for helping out, fantastic information. “I have witnessed the softening of the hardest of hearts by a simple smile.” by Goldie Hawn. Nice post. I learn something new and challenging on sites I stumbleupon everyday. It will always be interesting to read through articles from other writers and practice something from other sites. You completed certain fine points there. I did a search on the matter and found a good number of people will go along with with your blog. I have been browsing on-line greater than three hours as of late, yet I never discovered any fascinating article like yours. It?¦s pretty worth sufficient for me. In my opinion, if all website owners and bloggers made good content material as you did, the web might be much more useful than ever before. That is a good tip especially to those fresh to the blogosphere. Brief but very accurate information… Thanks for sharing this one. A must read article! Thanks for sharing excellent informations. Your web site is so cool. I am impressed by the details that you?¦ve on this website. It reveals how nicely you perceive this subject. Bookmarked this website page, will come back for extra articles. You, my pal, ROCK! I found simply the info I already searched everywhere and just couldn’t come across. What an ideal website. Some genuinely terrific work on behalf of the owner of this website , utterly outstanding subject material. Thank you for your entire work on this blog. Ellie delights in engaging in investigation and it’s really obvious why. We hear all regarding the lively manner you present good guidelines by means of your website and in addition foster contribution from others on the matter while our own girl is discovering so much. Have fun with the remaining portion of the new year. Your performing a wonderful job. Thankyou for this post, I am a big big fan of this site would like to proceed updated. Admiring the persistence you put into your blog and in depth information you provide. It’s nice to come across a blog every once in a while that isn’t the same old rehashed material. Fantastic read! I’ve saved your site and I’m adding your RSS feeds to my Google account. I’m now not certain the place you’re getting your information, however good topic. I must spend a while learning much more or figuring out more. Thanks for excellent information I used to be searching for this info for my mission. I’m impressed, I must say. Really hardly ever do I encounter a weblog that’s both educative and entertaining, and let me inform you, you may have hit the nail on the head. Your thought is excellent; the issue is one thing that not enough people are talking intelligently about. I am very joyful that I stumbled across this in my search for something referring to this. I’m curious to find out what blog system you happen to be using? I’m having some small security problems with my latest site and I’d like to find something more risk-free. Do you have any solutions? Esa es nuestra aspiración, si ella, en el transcurso de esa formación decide venirse para acá yo pienso que es como la realización del sueño de uno, que tu tienes el hijo aquí en la guerrilla, lo ves crecer con todas las dificultades, les das elementos de análisis y luego esos elementos de análisis le sirven a ella, para tomar la decisión de ingresar. Hi there! I simply wish to give a huge thumbs up for the nice data you’ve gotten here on this post. I might be coming back to your blog for more soon. May I just say what a comfort to discover somebody who really understands what they’re talking about on the web. You definitely know how to bring an issue to light and make it important. More and more people ought to check this out and understand this side of the story. It’s surprising you’re not more popular because you certainly possess the gift. Gracias a nuestro Servicio Técnico de reparacion Cocinas Teka en Madrid se acabaron los problemas para encontrar un equipo de especialistas en reparación. Si lo desea se encuentra fuera de horario comercial, comunique su averia a través de nuestro formulario online para solicitar asistencia tecnica realice una consulta rápida gratuita y nuestro departamento técnico se pondrá en contacto con usted a la mayor brevedad posible. I always used to read post in news papers but now as I am a user of web therefore from now I am using net for content, thanks to web. Excellent site you’ve got here.. It’s hard to find quality writing like yours these days. Hi there, just turned into aware of your weblog through Google, and found that it is really informative. I am gonna be careful for brussels. I will be grateful should you proceed this in future. Many other people will probably be benefited out of your writing. Cheers! Thanks for the blog post, can you make it so I receive an email sent to me every time you write a new article? I am not real good with English but I get hold this very easy to translate. I have been checking out many of your posts and it’s clever stuff. I will definitely bookmark your blog. Hi, I want to subscribe for this blog to obtain newest updates, so where can i do it please help. I have recently started a website, the information you provide on this site has helped me tremendously. Thank you for all of your time & work. “The achievements of an organization are the results of the combined effort of each individual.” by Vince Lombardi. I think what you posted made a great deal of sense. But, what about this? whoah this blog is magnificent i really like studying your posts. Stay up the great work! You already know, many individuals are searching around for this information, you can aid them greatly. In the grand scheme of things you actually secure an A+ with regard to effort. Exactly where you actually misplaced me was on your facts. As people say, details make or break the argument.. And that couldn’t be much more accurate in this article. Having said that, let me reveal to you what did deliver the results. Your writing is certainly extremely engaging which is probably why I am making an effort to opine. I do not really make it a regular habit of doing that. Next, while I can notice a jumps in reason you make, I am not really convinced of how you appear to unite your details which in turn produce the final result. For now I will, no doubt subscribe to your issue however trust in the foreseeable future you connect your dots much better. I conceive you have observed some very interesting points, thankyou for the post.